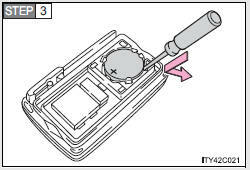 Open the case cover using a flathead screwdriver protected with tape etc. and remove the depleted battery. 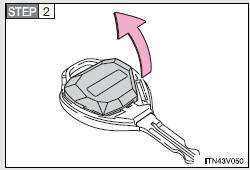 • The smart key system and wireless remote control will not function properly. • The operational range is reduced. 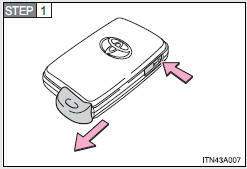 • Batteries can be purchased at your Toyota dealer, jewelers, or camera stores. 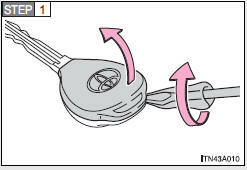 • Replace only with the same or equivalent type recommended by a Toyota dealer. • Dispose of used batteries according to the local laws. These parts are small and if swallowed by a child they can cause choking. • Always work with dry hands. 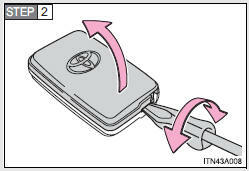 • Do not touch or move any other components inside the electronic key. 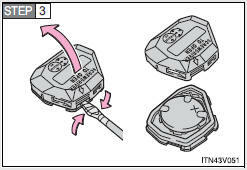 • Do not bend the battery terminals.